Why do journal transactions appear on the transactions page? Transfers, journal transactions, and invoice or bill payments require additional action to re-categorize them, because they are already "categorized" as their respective transaction type. Click the arrow on the right that appears when you hover over the transaction. Re-categorize the transactions according to your business needs. Select the invoice or bill link– this will redirect you to the invoice or bill where the payment is applied. Edit the payment and change the payment account. You can also delete the payment. Locate the transaction categorized as a Journal Transaction. Click Show details and Edit Journal Transaction. A journal transaction cannot be deleted from the Transactions page. Click Edit Journal transaction first. 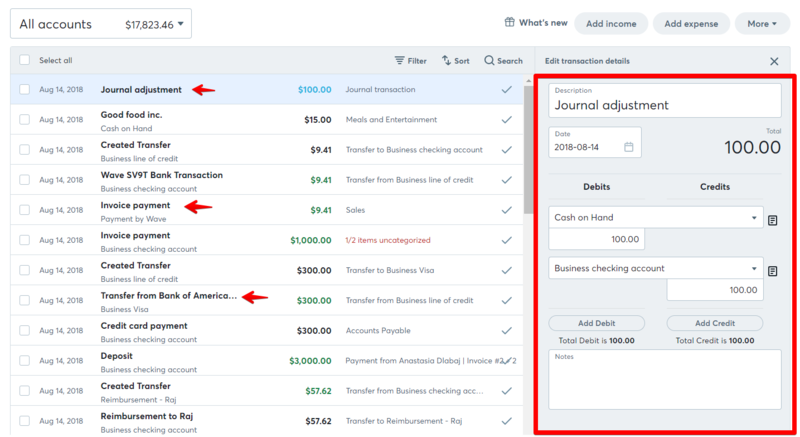 Click the Transactions tab under Accounting in the left-hand menu. Locate the Transfer, Payment, or Journal Transaction you wish to re-categorize and click on it. Edit the information according to your business needs in the right-hand details view.